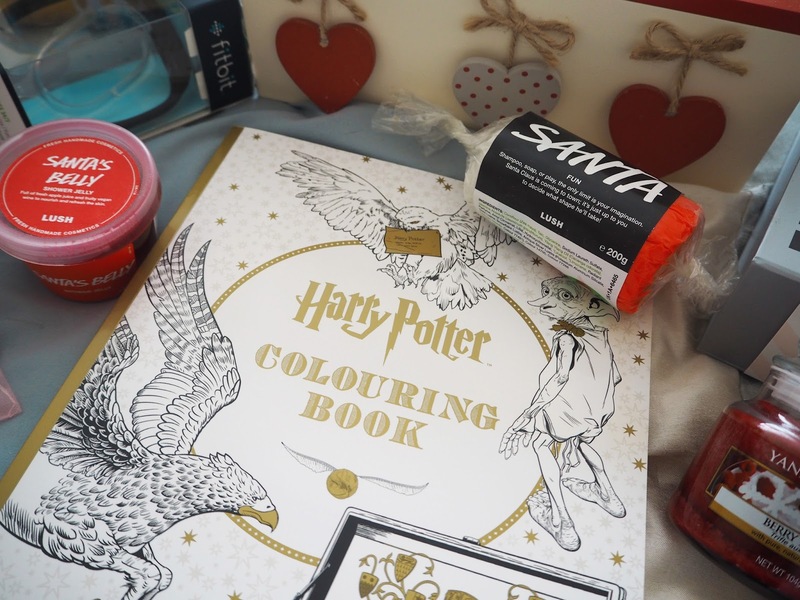 Today I'm sharing with you the lovely selection of gifts I got for Christmas, I I was a very lucky girl this year! I asked a couple of my friends for Lush products this year and so I ended up with this lovely selection to play with! Look how pretty they all look together. I'm trying to come up with a few different ideas for displaying them in the bathroom before they're used. I'll list everything that I got but I plan to do a more detailed review on all these items plus the bits I got in the sale in a separate post. 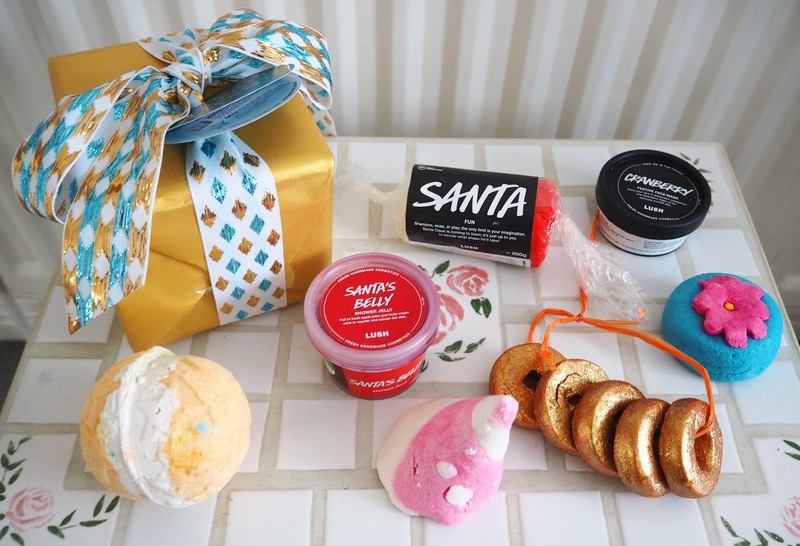 Clockwise: Golden Wonder Gift Box (containing 2 bath bombs), Santa's Belly Shower Jelly, Santa Fun, Cranberry Face Mask, Pop in the Bath Bubble Bar, Five Gold Rings, Candy Mountain Bubble Bar, Yog Nog Bath Bomb. I got a Fitbit so I can now track the number of steps, km and calories I burn at the gym. An apron saying 'Star Baker' (as a big fan of The Great British Bake Off I was very excited about this). A darling little Parisian mirror for my handbag. The friendship bracelet, which I talked about in my previous post, my sister made me from Australia. A pretty box that I'm either going to keep my Yankee Candle melts in or some makeup. I was also given this fabulous 8 piece Laura Geller Makeup gift set which I will review on the blog for you after I see what looks I can create! I was beyond excited to open this Harry Potter one that my cousin bought me! I don't know about you but I've been really into these adult colouring books lately, since I got a cat one for my birthday. It's great for some creative chill time! You know me I'm obsessed with candles so of course I got some for Christmas! Yankee Candle's Let it Snow is a special swirl jar that Clintons had in December it features both the fragrances Cherries on Snow & Sparkling Snow swirled together in one jar - too exciting! I'm a collector of their swirl jars as they're rare so I was very happy to get this. II alsso received a small jar of their new release Berry Triffle described as: "A seasonal treat that everyone enjoys, this Berry Trifle fragrance mixes together the mouth-watering scent of fresh berries, tangy and sharp, nestled on a white bed of soft vanilla cream to create a truly irresistible aroma that captures the true essence of home baking." I got a nice variety of books this year. If it fits, I sits - a book of pictures featuring cats trying to cram themselves into awkward places. My favourites being a printer, a wash basin and a car tyre! I got this from my cat Mandy (I know, but she's always got us presents! She's a good little shopper). 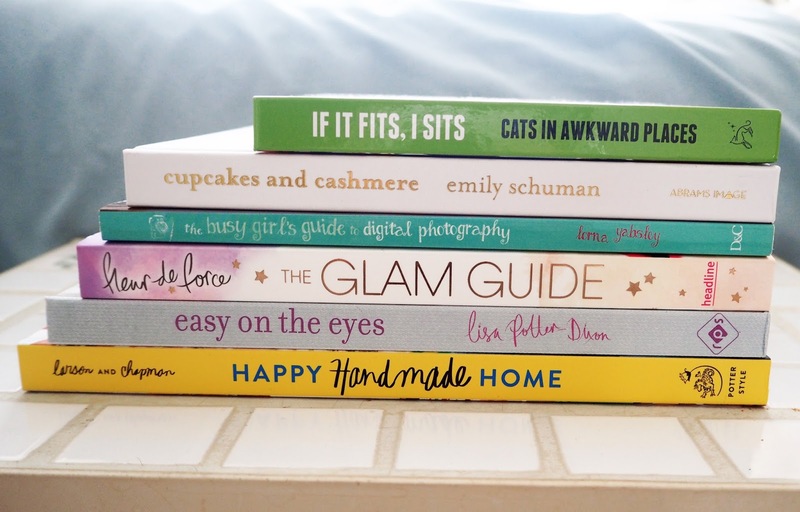 I then got a few books written by bloggers including Cupcakes and Cashmere by Emily Schuman and The Glam Guide by Fleur de Force which are lovely style and beauty related books. Plus Happy Handmade Home by two ladies who run one of my favourite lifestyle blogs A Beautiful Mess, I already have their Photo Idea Book which I absolutely loved so was excited to read this other book they released! 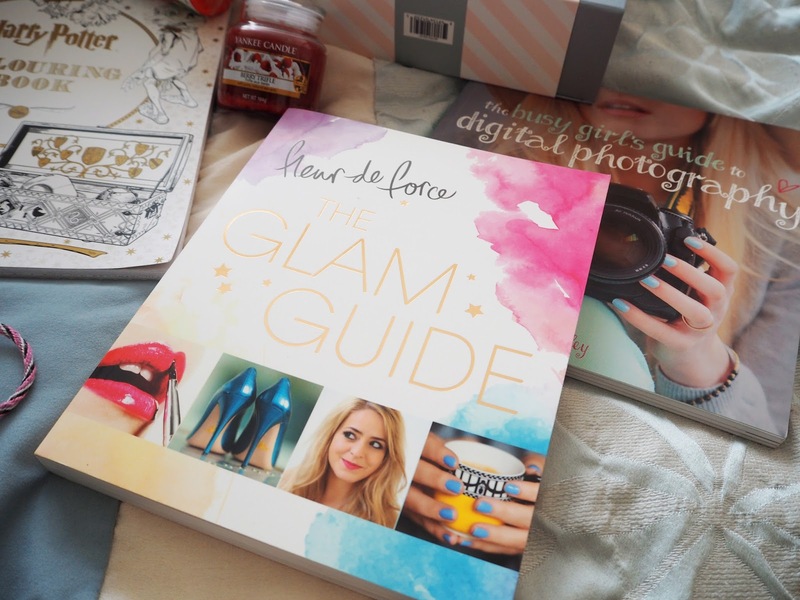 I also got The Busy Girls Guide to Digital Photography which has all sorts of useful tips and ideas for photography, from people to landscapes to food! Lastly I received Easy on the Eyes by Lisa Potter-Dixon who is a makeup artist for Benefit cosmetics, this book is full of different eye makeup looks and tips. How awesome is this little makeup bag from Nails Inc? 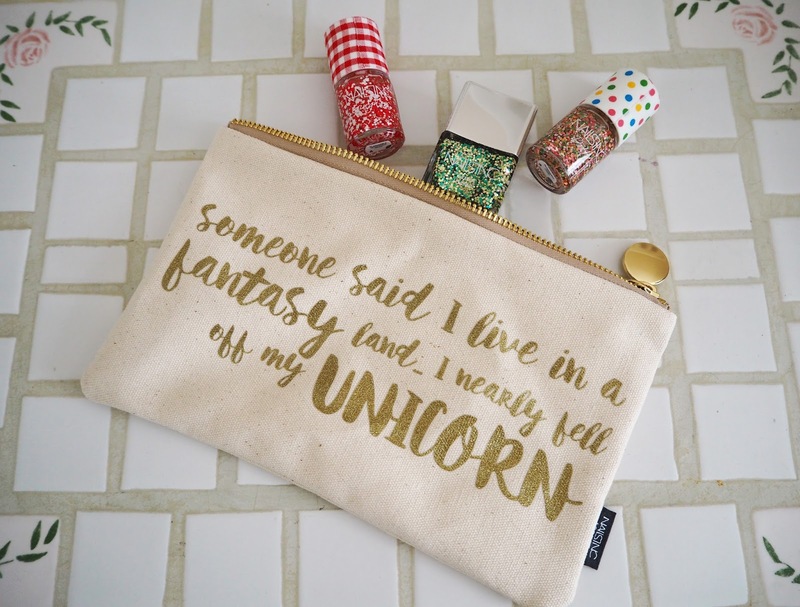 I fell in love with the slogan on it - Someone said I live in a fantasy land...I nearly fell off my unicorn. Brilliant! 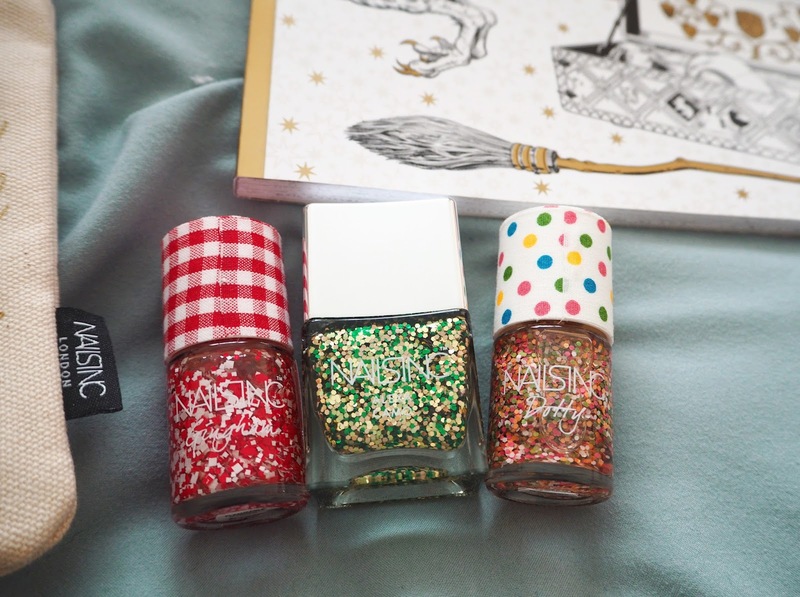 Inside were three lovely Nails Inc nail polishes that I'm looking forward to playing around with. I was given this luxury sized Sanctuary gift box by a friend! 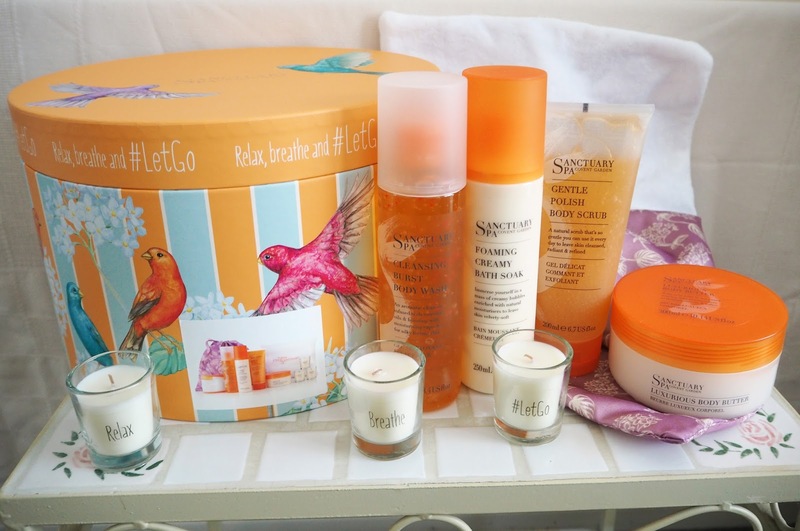 I love the fragrance of Sanctuary products and have been using them for a long time. I have never tried their candles however so I'm excited to try these three that came in the collection. The box also contains: Cleansing Burst Body Wash, Foaming Crwamy Bath Soak, Gentle Body Polish, Body Butter, Headband, Inflatable Bath Pillow for your head and a beautiful silk bag to keep it all in. I'm definitely going to have to find a use for this fab box too! Other gifts I received that aren't photographed include gift vouchers and chocolates. 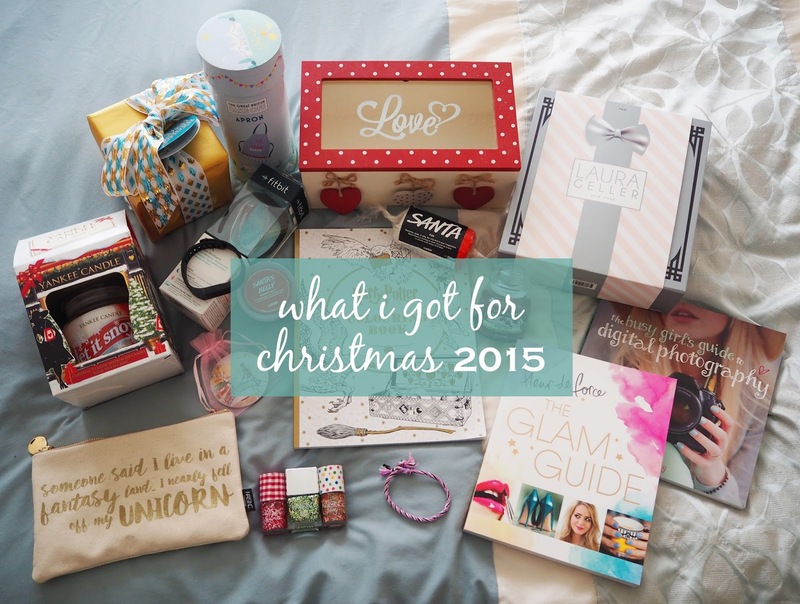 I hope you all received some lovely gifts this Christmas too! what were your favourite presents? I also had so many candles and bath products for Christmas! 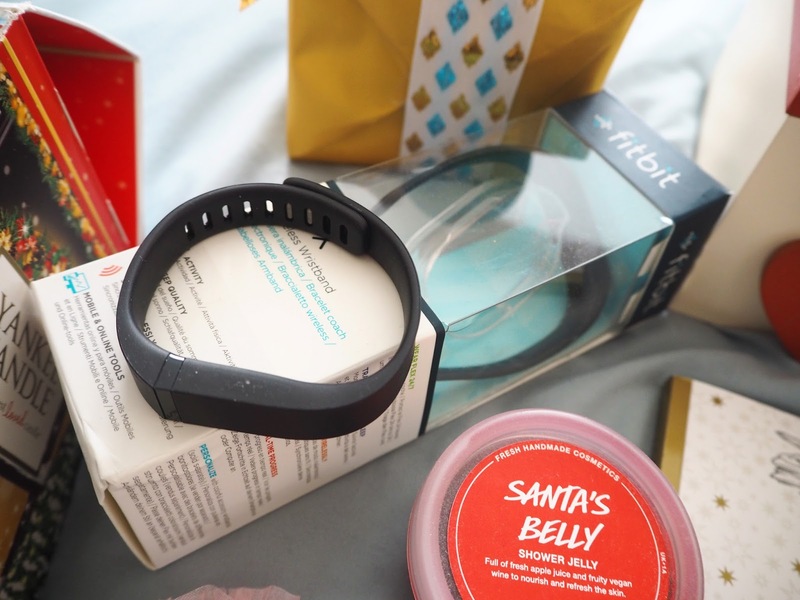 Quick question, how are you finding your fitbit? I've been tempted to buy one for so long!